What our own Daily Fishwrap (and apparently what Eagle’s Board of Trustees) FAILED to MENTION is that the very existence of these so-called Medical Marijuana Dispensaries are still illegal – under Federal Drug Law! Marijuana is a controlled substance under Federal Drug Law. The ECT folks would like to make this point clear, again. It doesn’t matter what side of the MMJ issue you’re on. Marijuana in any form is currently illegal under Federal Drug Law. Why the Town of Eagle’s Board of Trustees even had a public vote on the (continued?) existence of this illegal business is incomprehensible to the law-abiding ECT folks. For those readers who still believe that State Law somehow trumps Federal Law – the ECT refers you to the personal experience of (then) President Jefferson Davis (Circa 1861) vs. the view promoted by President Abraham Lincoln at the time. The ECT folks don’t know how long it will be, before U.S. Attorney John Walsh visits Eagle, Colorado – however the ECT will be diligently informing our U.S. Attorney’s Office of the activities of Federal Drug Lawbreakers here in Eagle County, Colorado. The ECT also wishes to point out that our own Board of County Commissioners has also voted to Violate Federal Drug law as well (Click Here – to see the Video of that documented fact). He’s only picking on dispensaries within 1,000 feet of a school. Kudos to the author for selectively ignoring that. Colorado is the most pot-friendly state in the country. Hooray! 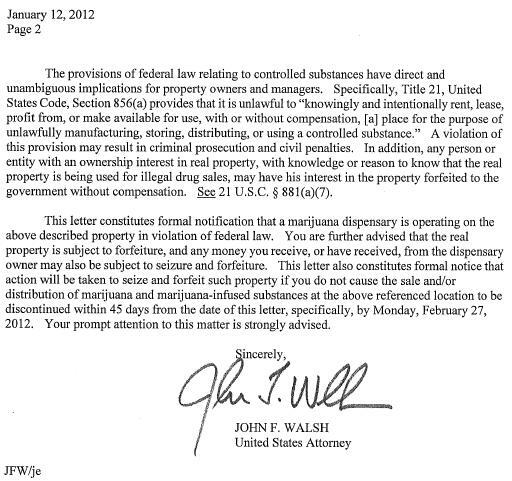 In fact the ECT included the lists of all Pot Stores that are on the U.S. Attorney’s list. Fact still remains…Federal Law SAYS NOTHING about “1000” feet around schools. I just says these stores selling this controlled substance are ILLEGAL! DENVER (AP) – A marijuana legalization measure on Colorado ballots this fall could face some competition. A second pot legalization proposal won clearance Wednesday from a state title board -the second measure sets no age limit. It also allows users to possess any amount and does not set up an excise tax for marijuana. LaMay’s measure simply removes criminal penalties for marijuana possession. Can you not smell the hypocrisy as you type? First you say the will of the voters, your neighbors in Eagle, should be ignored. Then you rail against states’ rights in the face of the federal government. This is your “conservative” platform? You are among a minority that is growing ever smaller. Don’t be run over by history. Zach – why do you insist on missing the POINT? Why don’t you just work to change Federal Drug law? Why are you supporting a Republic that should run on “government by agenda”. That’s what you (and confused others) obviously support. Let’s all play by the same set of rules (read laws). If the laws need to be changed, OK, change ’em. They did with Prohibition, right? Let’s all play by the same set of rules, OK? Could you please just get off your “high horse”? As explained in my recent article in “the Daily fish wrap”, (as you love to call it) I don’t smoke pot. However, this issue is not about me, nor is it about you…its about what OTHERS want. As bantered back and forth in emails with “staff” here at ECT there are thousands of articles, University findings,etc that PROVE marijuana effectively treats chronic pain for injuries, cancer, helps with insomnia, appetite issues, glaucoma, etc..Addictive, harmful prescription meds also treat these ailments, yet you seem to have no problem with those. Alchohol is far worse in many instances (know to cause vehicular accidents, a host of health issues and liver problems, etc) There is not one documented case of death by injestion of marijuana, I sent you a you tube done by a respected Harvard PHD with facts about this. Why do YOU choose to ignore the facts? This mmj issue with dispensaries is presently a “medical issue” -who are you to play Doctor?. 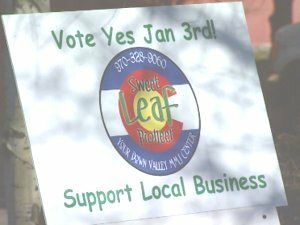 Sweet Leaf in Eagle, in particular, has cleared numerous hurdles to even open their business and has been totally compliant with the state’s own regulatory agency (which has VERY strict regulations) The bottom line is we have a constitution- and that goes on the premise that government should be run “for the people, by the people”. What I love is you don’t even have respect for the federal government, (being that its presently a liberal one) As Fred Butler’s eloquent article states (that will soon appear in the Vail Daily-also sent to “STAFF” here just yesterday) the federal government is not governing by the “will of the people” Fred has a law degree and pulled various sections of the law, statutes, etc in his article. It was sent to you as well as the Daily. Dare you run it and show free speech (another part of our constitution)? or…would you prefer to have this just a one-sided news source when it comes to editorials. BOTTOM LINE. -It should be legal (like alchohol is) be restricted to those over 18 and we should TAX THE HELL OUT OF IT (like with alchohol and tobacco (another known KILLER)…maybe that will help with curtailing cartels and our national debt situation. This is a PERSONAL choice- not government’s. You’ve convinced the ECT folks that your great, great granddaddy fought alongside Robert E. Lee and the rest of the Confederacy! “State’s Rights!” after all. More recently – you no doubt have relatives that fought in the great Roe v Wade battle in the seventies, again another triumph of individual “States Rights!” No law of the land here!!!! Why not spend more time changing Federal Drug Law – and less time trying to convince ECT readers it’s OK to ignore some laws…but not other laws…you don’t agree with? Why have one set of laws that govern all equally – when we can have “Government by Agenda” – Yippie! Government by Agenda – it’s a “State’s Rights” issue, by golly, by Gee!!! I agree that we need to change the federal law— that is in the works. In the meantime, there are much bigger fish to fry politically in this county and the nation. MMJ (and your total vigilance against it) should take a back seat. Just sayin! I think eaglecountytimes would be a lot happier and less bitter and on edge if he toked a bong on occasion. Below not an ECT opinion – just the facts, ma’am…about current events. So, what are the real facts why they are crackin down in San Diego? FACT IS…San Diego is known for being unfriendly for decaces regarding marijuana. That’s their history. No big news there.. Looks like the taxpayers there should be questioning their hard earned money being spent on these trivial issues. Everytime you bring up the federal government repeatedly doing the wrong thing in regards to not listening to what the people have voted on, its strengthen our case for “power to the people” and weakens your case. Furthermore, there should be better ways to spend a Friday afternoon than belaboring this issue, however thank you for trying to keep us up on things. No doubt, you will be drinking a coldy within the next hour or so at that Avon bar you love so much…possibly some people there would be driving home just a bit over the legal limit? hahaha. Happy FAC.